NEW YORK TIMES BESTSELLER - NAMED ONE OF THE BEST BOOKS OF THE YEAR BY THE A.V. CLUB - From the writer and director of Knocked Up and the producer of Freaks and Geeks comes a collection of intimate, hilarious conversations with the biggest names in comedy from the past thirty years--including Mel Brooks, Jerry Seinfeld, Jon Stewart, Roseanne Barr, Harold Ramis, Louis C.K., Chris Rock, and Lena Dunham. Before becoming one of the most successful filmmakers in Hollywood, Judd Apatow was the original comedy nerd. At fifteen, he took a job washing dishes in a local comedy club--just so he could watch endless stand-up for free. At sixteen, he was hosting a show for his local high school radio station in Syosset, Long Island--a show that consisted of Q&As with his comedy heroes, from Garry Shandling to Jerry Seinfeld. They talked about their careers, the science of a good joke, and their dreams of future glory (turns out, Shandling was interested in having his own TV show one day and Steve Allen had already invented everything). Thirty years later, Apatow is still that same comedy nerd--and he's still interviewing funny people about why they do what they do. 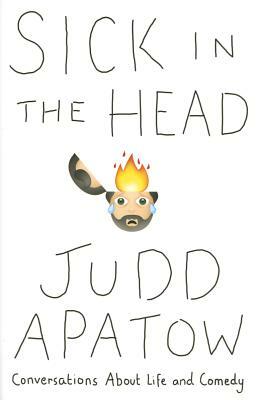 Sick in the Head gathers Apatow's most memorable and revealing conversations into one hilarious, wide-ranging, and incredibly candid collection that spans not only his career but his entire adult life. Here are the comedy legends who inspired and shaped him, from Mel Brooks to Steve Martin. Here are the contemporaries he grew up with in Hollywood, from Spike Jonze to Sarah Silverman. And here, finally, are the brightest stars in comedy today, many of whom Apatow has been fortunate to work with, from Seth Rogen to Amy Schumer. And along the way, something kind of magical happens: What started as a lifetime's worth of conversations about comedy becomes something else entirely. It becomes an exploration of creativity, ambition, neediness, generosity, spirituality, and the joy that comes from making people laugh. Loaded with the kind of back-of-the-club stories that comics tell one another when no one else is watching, this fascinating, personal (and borderline-obsessive) book is Judd Apatow's gift to comedy nerds everywhere. Judd Apatow is one of the most important comic minds of his generation. He wrote and directed the films The 40-Year-Old Virgin (co-written with Steve Carell), Knocked Up, Funny People, and This Is 40, and his producing credits include Superbad, Bridesmaids, and Anchorman. Apatow is the executive producer of HBO's Girls. He was also the executive producer of Freaks and Geeks, created Undeclared, and co-created the Emmy Award-winning television program The Ben Stiller Show. His latest film is Trainwreck. He was also the editor of the collection I Found This Funny. Judd Apatow lives in Los Angeles with his wife, Leslie Mann, and their two daughters, Maude and Iris.